The Varshava hotel is located in the southern part of Golden Sands some 350 metres from the centre. The majority of rooms offer a fine view of the sea and the entire resort. I would never recommend anyone to go to this hotel. Yes, it's not a hotel, it's a hostel.It is absolutely awful place to stay. The Balkan Holidays should stop booking with them as it damages their reputation as well. I personally, wouldn't ever book any holiday with Balkan Holidays.Generally, I didn't enjoy holiday in Bulgaria, despite cheap prices. Nothing to see, just sea and sunshine. This Hotel...is a Hostel. We arrived earley hours of the morning. Our room was a family room in the yellow section. we were lucky. Spacey, air conditioned and we had a fridge and t.v. the bed was old and threadbare. All inclusive package is horrendous. The food will be cold, and sparse. you can ask for fried eggs at breakfast but be prepared for a long wait. staff played the 'do not understand' bit to perfection. we shared the hotel with 250 students who ran riot in the lifts and corridors, took over the small swimming pool playing water polo and expected us to throw the ball back constantly. Please be aware that there will be kids there all through the summer. bedding wasnt changed for the whole 2 weeks we were there, room service is every 4 days. If you have the chance pay extra and go 3 star or above. This has to be the worst hotel in Bulgaria ! the worst hotel we have ever set eyes on, the resort of Golden Sands is lovely with heaps to do and see day or night. the Hotel is grubby the staff are grubby and rude, the food is appaling, the rooms are dirty and cramped, we had no clean towel or bedding change in a whole week and had to ask for new loo roll. the restaurant is small with dirty table cloths chipped crockery and dirty glasses, the pool is clean but has weeds and broken slabs all around it with a life guard that looks like he needs resuscitation to rescue someone, and you have to pay for sunbeds, parasols and mats at your own hotel!! the hotel has 2 lifts to 10 floors although the hotel has 11 floors, one of the lifts was out of order all week, the lobby smells of dirty mops, the loos are tiled and slippy the staff do not crack a smile the beds are single beds with ripped stained filthy mattresses, the rooms are cramped and basic 2 beds and a table, the bathroom is small and the shower and loo are unkempt with dirty taps etc, the wardrobes were dirty and dusty, the electric sockets are hanging off the walls and still live, the balconies on the front of the hotel are not very safe the railings are loose, it is the very worst hotel I have ever seen and everyone that was with us said the same. the Varshava needs demolishing it is a very old dirty hotel and lets the resort down. Breakfast comsists of toast on a toaster that takes 10 minutes, hard boiled eggs, chopped hot dogs, white cheese cubes, spag bol(probably yesterdays) fried potatoes and squash the meats are rubbery and fly ridden the milk is watered down and one cereal is available. it is disgusting, beware! AWFUL AWFUL hotel i have never seen a hotel like this in my life.The staff were rude and disgusting never changed their clothes.Very bad smell outside the lifts it smelt like smelly feet.Breakfast area disgusting table cloths never changed sour milk,moulded bread.Rooms had plug sockets hanging off walls,holes in bedlinen,smelly towels.Pool area was disgusting weeds,dust and dirt.Guests were expected to pay for sunbeds,a smelly pool attendant asked for the money looked like a tramp fron the streets.Would not go back to Bulgaria it is full of german lager loots,working girls on the street and drug dealers,not a place for a family holiday.Nothing cheap we found it very expensive for a family of four.We met some lovely guests in hotel they all had the same reviews as us the hotel needed knocked down,and did'nt know how this hotel is aloud to stay open. NEVER AGAIN!Aoa.1st impressions-very basic.Rooms dirty and cramped .No storage space,had to leave clothes in suitcase under beds.Basin & toilet cracked.Linen and towels old and dirty, not changed regularly. Balcony unsafe & dirty. Breakfast & drinks disgusting. Poolside dangerous with sunken & broken flags.We were eventually forced out by the infestation of mice in our 3rd floor room. According to the rep they came in from the trees. Generally the staff were friendly, but the overall cleanliness & hygiene left much to be desired. The hotel is known to the locals as the dos house of vara.The balkan rep was quite helpfull & understanding of the situation. Shame about this hotel. Rooms cramped, stayed for one week had towels changed once and bed linen never changed. Only things cleaners did was empty bin and that was wasn't done every day. Evening meal was average but menu was same every day. 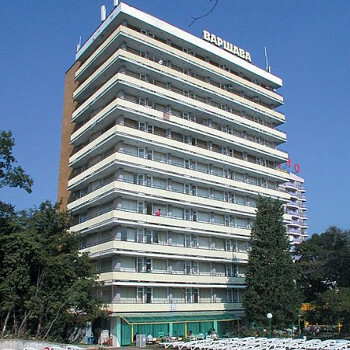 Will go to Bulgaria again but definitely not to this hotel. This hotel was filthy, the bathroom was a box, the door opened under the shower head, the shower head was covered with thick limescale, so much so that it was a thick greenish blue colour, the sink had brown stains on it. The room was a shoe box with two single beds lined up against a wall, the fridge that you could rent was older than the hotel! the milk was watered down at breakfast and the toaster was as old as the fridges. The hotel was built over 30 years ago so we have been told, The balcony, if you could call it that, looked out over the main road behind the resort. Avoid at any cost. filthy cramped box rooms without necessary aircon, even more cramped combined toilet/shower - must remove toilet paper everything gets wet. Shower water has smell of sewage. Unusable balconies unless you are much less that a metre tall. Despite brochure most room do not have a sea view much less a spectular one. Dirty threadbare towels & bedsheets with holes in we were there 2 weeks sheets changed once; towels 4 times. Reception staff do their best in absolutely awful circumstances and are usually cheerful which is testament to the human spirit. Kitchen staff mostly unhelpful & idle. Breakfast scrambled, bread, butter, jam, tomatoes, oranges & goats cheese ok and edible - usually have to ask for eggs and hot water as they only scramble 4 at a time so you wait and wait. Fruit juice just sugared coloured water, tea and coffee undrinkable. Must ask for hot water and its never hot. Cold meats not for human kind. Toaster in dining room just slowly toasts 4 pieces of bread at a time on the oldest toaster we have ever seen so you wait and wait as a queue grows. We hired a fridge & kettle - the oldest friges on earth and must be seen as they are ancient converted wooden larders that in truth do not do their job we went through 4 until we got the only modern fridge in hotel - kettles do not work either we had to go down 10 floors with empty kettle where reluctantly staff gave us hot water despite the fact we paid to hire equipment. The pool is fine but guests must pay for daily use of sunbeds. Lunchtime soup is from a packet and the only entertainment is seeing the faces of guests who have just come back to reception having seen their so called rooms and the sheer horror on their faces as they complain to the anxious troubled looking manageress. And do not expect any aid from Balkan rep unless there is a chance to make a profit from you as they will cheerfully offer you an upgrade at several hundred pounds for 2 weeks. Great location 10 mins from beach less to centre if this place does not put you off Bulgaria little short of neuclear attack will. The hotel was clean and the staff were friendly. The hotel was at the top of a hill and I wouldnt recommend it for anyone with walking difficulties. The beds are top to tail, the rooms are very very small, but like other people have said you only sleep in them and you get what you pay for. This holiday was very cheap, so cant complain. The food wasnt bad, in fact we ate in the restaurant a couple of nights, basic but good value for money. The pool bar served decent snacks and drinks. We wouldnt use this hotel again.